Édouard Manet, Plum Brandy, ca. 1877, oil on canvas, 29 x 20". These days, the Van Gogh Museum is full of whores. “Easy Virtue,” which focuses on prostitution in nineteenth- to early twentieth-century French painting, is a historical exploration of a trade under scrutiny. 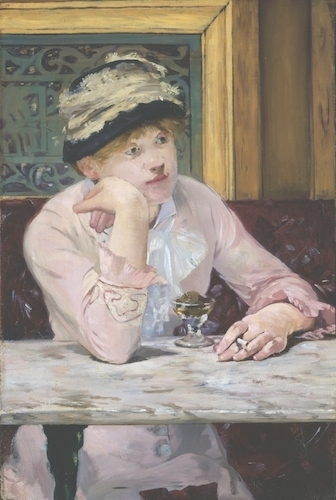 The subject of Édouard Manet’s Plum Brandy, ca.1877, rests her head in her hand at a café table, the full glass before her suggesting she has just sat down. In her left hand dangles an unlit cigarette, awaiting a light from a potential client. Her skin is the same shade of pale, withered pink as her dress, but it is her tired, blank eyes that draw us in. Learning how to read the signs of an available woman became an exercise of intrigue, for prostitutes often dressed the same as so-called respectable women in order to protect themselves. Certain professions, however, gave it all away; Jean Béraud’s Backstage at the Opera, 1889, depicts a crowd of older gentlemen in top hats sleazing among the ballet dancers after a performance. It was widely known among upper-class milieus that holding a season ticket to the ballet also entitled one to post-show favors from the dancers, who were poorly paid and needed supplemental income.